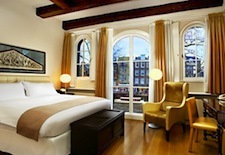 The Dylan Amsterdam: Tucked away on the atmospheric Keizersgracht, The Dylan (www.dylanamsterdam.com) effortlessly manages to be both edgy and intimate. From its pretty courtyard entrance and unassuming lobby, you’ll be drawn into either an inviting bar and lounge or an enclosed vine-draped garden lined with tables. Upstairs, the 40 unique rooms and suites are decorated in eight distinctive themes. The newest, unveiled just last month, is Loxura (shown below at right). Named for a copper-winged butterfly and located around the inner garden, they feature the warm and elegant color in bronze mirrors and soaring leather headboards. Also richly romantic are the Klassbol rooms with raspberry red and gray décor, and the spare Kimono rooms with black four-poster beds for couples who prefer a Zen influence. Dining-wise, The Dylan is home to the romantic, Michelin-starred Vinkeles (www.vinkeles.com), serving contemporary French cuisine by Chef Dennis Kuipers. Vinkeles, set in what was an 18th-century bakery, has just nine tables, so reserve at least a week in advance (two weeks for weekends). A lighter and quite delightful option is The Dylan’s “High Wine,” a 39.50 euro ($57) per person, four-course wine tasting with paired small plates, served from 3pm to 7pm daily in the atmospheric Long Gallery Lounge. My boyfriend and I found the wine selection – a Swiss pinot gris, a French viogner, a Burgundy gamay, and a Hungarian dessert wine – paired perfectly with the small plates ranging from delicate shrimp to savory lamb to irresistible white chocolate and apricot mousse, was the perfect way to wind down after a day of wandering. Rooms from $469/night. 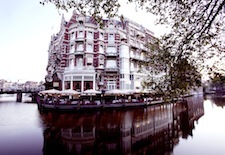 Hotel De L’Europe: Fresh off a year-long renovation (the grand re-opening is June 23, 2011), the circa-1896 Renaissance-style Hotel de L'Europe (www.leurope.nl), with its prime corner location on the Amstel River (shown at left), is renowned for more than its canal views. Owned by the Heineken family, the L’Europe features original Dutch Masters paintings from the private collection of the late Freddy Heineken, for whom Freddy’s Bar, a cozy watering hole featuring a carved wood bar and jazz pianist, is named. There’s also a 30-foot indoor, canal-level pool and a spa (opening in the fall). In the lobby and other public areas, the hotel’s period décor has been updated with vibrant red-orange walls and accents of gold, brown, and green, while its infrastructure has been given an ecological and technological facelift. The 88 rooms in the original hotel feature four palettes (black with gray and cream accents; cream with blue, green, and red accents; red with green and gold accents; and blue with white accents) in 10 room and suite styles. In addition, a luxurious Dutch Masters Wing, opened in March 2010, offers 23 loft-like suites with décor inspired by a large reproduction of a Dutch Masters painting from the nearby Rijksmuseum National Gallery. 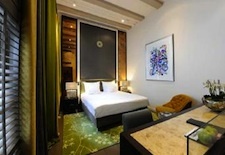 Color-saturated and contemporary in style, they feature fabulous bathrooms and superb organic Coco-Mat mattresses. Under the direction of executive chef Richard van Oostenbrugge, Hotel De L’Europe features five dining outlets: Bord’Eaux, a salon-like canal-side fine dining restaurant featuring contemporary French cuisine with a Dutch flare; Hoofdstad Brasserie, an open-kitchen venue serving “Amsterdam-accented” modern continental cuisine (the veal shank with potatoes and horseradish is exceptional – and the inspired deserts are divine); plus the aforementioned Freddy’s Bar, the Promenade lounge along the hotel’s main passageway, and the Het Terrace, an open-air dining terrace serving Parisian-inspired café classics and fresh local fare. For couples seeking a past-meets-present vibe in see-and-be-seen Amsterdam, this is the place. Rooms from $475/night. Hotel Pulitzer: Lovers of all things vintage, eclectic, and artistic should consider this unique hotel, developed by Peter Pulitzer in 1970 and now comprised of 25 17th and 18th-century canal houses straddling the Prinzengracht and Keizersgracht with a lovely, tree-filled courtyard at the center. The effect is that of an intimate neighborhood, with guests directed via greenhouse-like passageways and atmospheric staircases featuring ornate chandeliers and moldings to 230 light-filled rooms, each unique in size but similar in warm, neutral décor (shown at right). The best overlook either canal, and those on the top floor feature dramatic beamed ceilings. Note: You may recognize the hotel from its starring role in the 2004 film Ocean’s Twelve, for which the main restaurant was transformed into the lobby. While meandering through the property, guests can admire a rotating exhibit of paintings in the impressive corridor Art Gallery. And don’t miss French artist Thierry de Cromieres’ 6-foot-by-19-foot painting called “Hals’ Brunch,” a playful take on Frans Hals “The Last Supper,” with a mix of historic and contemporary figures sipping Heineken, typing on a laptop and eating fries and burgers. It’s located in Keizersgracht 238, the hotel’s recently renovated grill restaurant, where the newly opened Wine Salon “de Apotheek,” a stunning room in what was a pharmacy, is available for wine tastings and pairings. The adjacent Pulitzer Bar is a series of three cozy rooms painted in rich hues of blue, red and black – inspired by Johnny Walker labels. The hotel also has a private canal boat for hire, an art deco-style “saloon cruiser” built in 1909 and once used by Winston Churchill. If retro-romance is your style, this Starwood Luxury Collection property is the hotel for you. Rooms from $445/night. Hotel Sofitel Legend The Grand: Hands down the best entrance in Amsterdam, the Sofitel's massive courtyard and dramatic lobby live up to the other parts of its name: “Legend” and “The Grand” (www.sofitel.com). Built in the 15th century as a convent and converted to the city hall before becoming a hotel, it is a visual delight of historic architecture and bold, contemporary décor. Just recently renovated, the long hallways feel convent-like but the 177 rooms and suites are bright, sleek, and modern, with high ceilings and vibrant color and pattern accents. Under Sofitel management, The Grand has emerged as a chic sanctuary with a stunning yet serene inner courtyard – even though it is just a few hundred yards away from the rowdiness of the Red Light District. Adding to the relaxation factor is the So Spa, set on the lower level and offering a sauna, steam room, heated pool, and Jacuzzi. 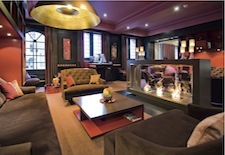 The hotel’s biggest wow factor is provided by its social areas, from the plush lobby lounge with its seductive garnet, olive, and eggplant velvet tufted sofas and freestanding glass fireplace (shown at left) to the distinctly modern lines of the Bridges Bar with its white walls and sunflower, brown, and chrome décor. Bridges Restaurant, helmed by Chef Aurélien Poirot, serves refined French cuisine with an accent on seafood and seasonal organic ingredients. In summer, when the weather allows it, enjoy pre- or post-dinner cocktails in the lovely, romantically lit inner courtyard. Rooms from $423/night. See our Amsterdam Travel Guide for more trip-planning information, then use our Travel Search price comparison tool to find the lowest rates on flights, hotels, packages and more travel deals.